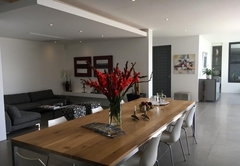 Bayview Guesthouse is one of the Tamboerskloof guest houses and provides accommodation in 5 guest rooms for tourists visiting the City Bowl region. 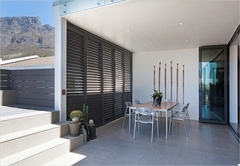 Bayview House welcomes you in an architecture of inspirational elegance with spectacular views, overlooking Table Mountain, recently voted one of the 7 Natural Wonders of the World. 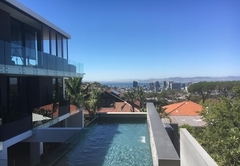 Stepping out onto the private terrace, the modern design and luxurious decor of Bayview House blend perfectly with the magnificent views of Cape Town, Table Bay and Table Mountain. 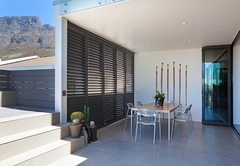 This is the ideal location for perfect leisure and business travelers who are seeking a gently pampered environment near to the main attraction of the “Mother City”. 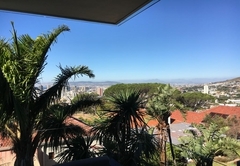 Bayview Guesthouse is situated in a quiet residential street within short distance to city centre, V&A Waterfront, Table Mountain and some of the most wonderful beaches - Clifton & Camps Bay. 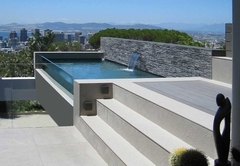 Trendy Kloof Street with many Restaurants, Deli’s, and Bars are only a short stroll away. 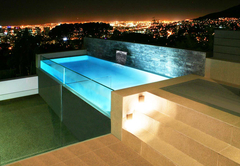 Less is More - modern designed luxuriously decorated. 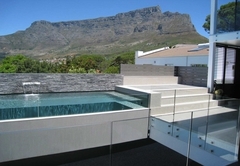 The architectural elegance of Bayview House truly offers an amazing atmosphere. 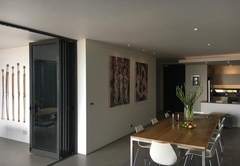 The open, airy style of Bayview House instills a sense of calm, while the serene atmosphere is further enhanced by skilful application of colour, play of light, modern sculpture and vibrant paintings with an African touch. 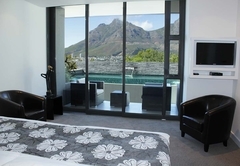 The rooms offer spectacular views over the City, Table Mountain and harbour. 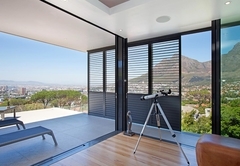 Explore the beautiful city of Cape Town and its surroundings, or simply do nothing at all – it’s up to you. Bayview’s modern designed luxury rooms are all dressed with white cotton linen. 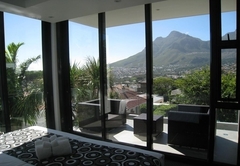 Bathrooms are en-suite with walk in shower. 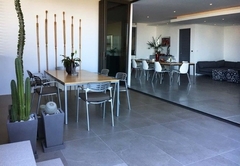 Satellite TV - A/C, Bar fridge, Nespresso coffee machine, underfloor heating – Laundry service available – secure inside parking. Breakfasts are an alpine feast of wonderful fresh breads, selected cheeses and cold meat with fresh fruit of the season. Or you may be tempted with our delicious presented hot breakfast, which is served inside or by the pool terrace. Christine & Staff welcome you at Bayview House and offer advice of the secrets of our city, tourist attractions, restaurants and other places of interest on the Peninsula. German & Swiss German spoken. 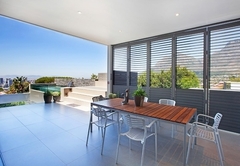 Great upstairs room with fantastic view. The Superior Room contains two extra-length single beds that can be converted to a king-size bed, and an en-suite with a walk-in shower. 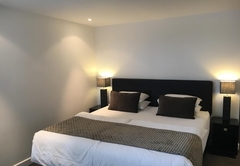 Room facilities include air-conditioning, underfloor heating, automated curtain blinds, a tea and coffee tray with a Nespresso coffee machine, a bar fridge, flat-screen TV offering 10 set channels, wireless internet, a hairdryer, and an electronic safe. This Deluxe Room contains two extra-length single beds that can be converted to a king-size bed, and an en-suite with a walk-in shower. 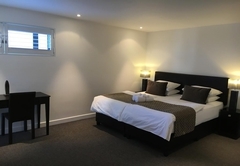 Room facilities include window blinds, a tea and coffee tray with a Nespresso coffee machine, a bar fridge, flat-screen TV offering 10 set channels, wireless internet, a hairdryer, and an electronic safe. 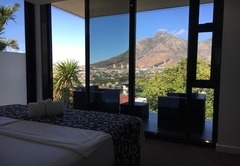 The Premier Room has two extra-length single beds that can be converted to a king-size bed, an en-suite with a walk-in shower, and a private terrace. 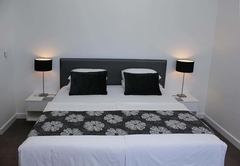 Room facilities include air-conditioning, underfloor heating, automated curtain blinds, a tea and coffee tray with a Nespresso coffee machine, a bar fridge, flat-screen TV offering 10 set channels, wireless internet, a hairdryer, and an electronic safe. 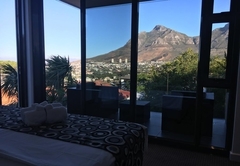 Luxury Room contains two extra-length single beds that can be converted to a king-size bed, an en-suite bathroom with a walk-in shower, and a private terrace. Other room facilities include air-conditioning, underfloor heating, automated curtain blinds, a tea and coffee tray with a Nespresso coffee machine, a bar fridge, flat-screen TV offering 10 set channels, wireless internet, a hairdryer, and an electronic safe. The Classic Room has two extra-length single beds that can be converted to a king-size bed, and an en-suite with a walk-in shower. Room facilities include window blinds, a tea and coffee tray with a Nespresso coffee machine, a bar fridge, flat-screen TV offering 10 set channels, wireless internet, a hairdryer, and an electronic safe. Response timeBayview Guesthouse typically responds to requests in 5-10 minutes.